Call to the European Commission: This is the time to make it happen! Scientific research has proven the negative health effects of alcohol consumption (WHO, 2014), as well as that exposure to alcohol advertising leads to advancing the onset of alcohol consumption and increasing the amount consumed, as well as the frequency of consumption (Smith & Foxcroft, 2009,Anderson et al., 2009). Why is it then, that advertising for tobacco and prescriptive drugs is banned at the EU level, while alcohol advertising and sponsorship are still pervasive in all EU member states? If we want to protect our children against the harmful effects of alcohol advertising we cannot wait for our national governments to enforce alcohol advertising restrictions. 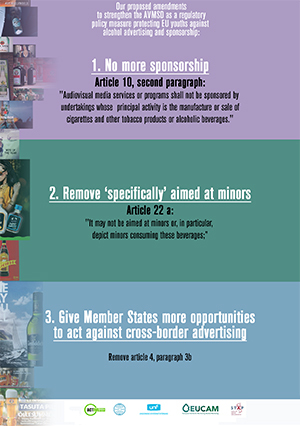 Now is the time to demand a first step in better protecting the children of Europe: By strengthening the restrictions on alcohol advertisements and sponsorship in the Audiovisual Media Services Directive(AVMSD). The AVMSD is the only legal directive regulating media throughout the EU. Consequently it currently is the only European legal document that regulates alcohol advertising. However, we believe that the AVMSD in its current version does not adequately protect minors against alcohol advertising. At the moment the European Commission has opened a public consultationasking for feedback on the AVMSD and how this directive may be improved. The signatories of this message want to appeal to you to let your voice be heard. We have made it easier for you to fill out all the consultation questions byoffering an answer guide (see below), in which we offer answers already filled in. Additionally, with this email we offer you a two page brochure (see below), shortly describing the problems with the AVMSD and alcohol advertising as well as offering three policy recommendations on the themes of (1) sponsorship; (2) attractiveness to minors; (3) trans-border broadcasts. We want to send this brochure in to the Digital4eu online platform, including a list of signatories who endorse the message that the AVMSD has to be revised on the themes of sponsorship, attractiveness to minors and trans-border broadcasts. If you want to subscribe our message to the European Commission, all you have to do is send us a reply (eucam@eucam.info) before Tuesday the 29th of September and we’ll put your name in.